One of the main objectives of the survey was to find out exactly how and why travelers use online reviews and what other aspects of these reviews they find most convincing when booking a hotel. You can read about the findings with important aspects with corresponding charts highlighted below. Among the respondents, the largest group said they never checked online customer reviews and those who did use online reviews skewed younger: 30 percent of them belong to age group of 25 to 34 years old who used reviews most of the time, and 28 percent in the age bracket of 18-24 always use reviews. 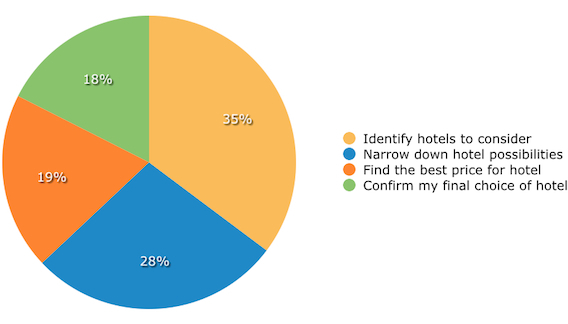 Next, the survey asked respondents on what exactly they were looking for when looking at online reviews before booking a hotel. 35 percent of them use to identity hotels to consider, while 28 percent use them to narrow down their choices to selected few. 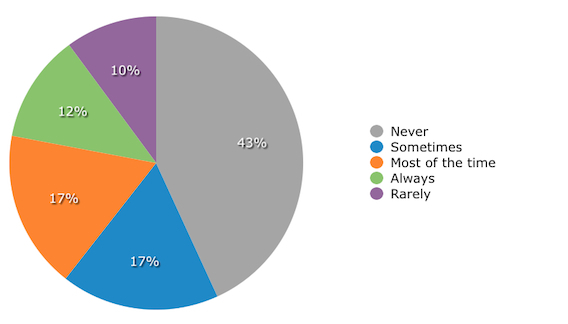 What is your most common reason for checking online customer reviews of hotels? 19 percent of respondents use reviews to find the best price for their choice of hotels and rest 18 percent to confirm their final choice of hotel. Internet is the first place to look for hotel and travel information for majority of the travelers today. The popularity of review websites providing all the information and photos can be easily accessed today via various devices easily. Today’s traveler directly search for for hotels on a review site instead of directly checking the website of the hotel or even calling the property. Expedia came on top as the most popular online hotel review website when travelers were asked which site they use most often, with 38%. Popular travel review site TripAdvisor came in second with 28 percent and third was Hotels.com, at 25 percent. 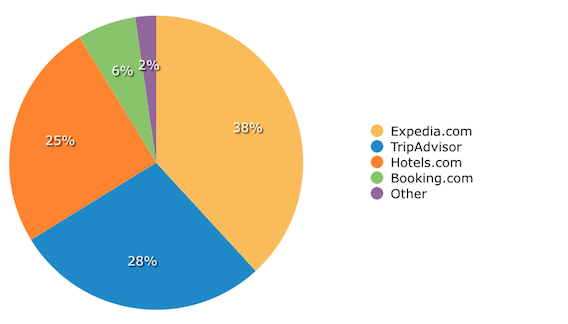 When viewing online customer reviews of hotels, what website do you use most often? Among other options, Booking.com, received 6 percent. 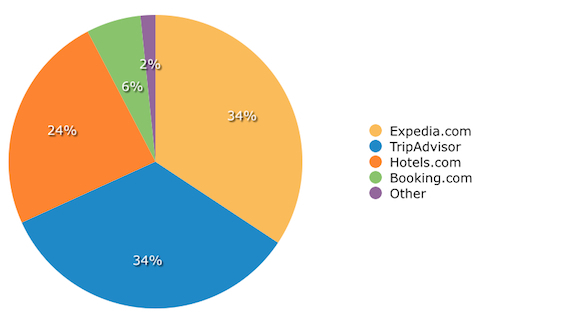 Two percent of the travelers chose none of the above and entered their own choice of website, including Hotewire.com, Kayak.com or just a Google search. TripAdvisor and Expedia generate traffic of 260 million and 60 million visitors per monthly respectively, both of the websites offer different services to the travelers, which accounts for these numbers. TripAdvisor offers reviews and hotel information for travelers and directing them offsite to complete a booking. Expedia on other hand operates as a full-service travel site, selling multiple types of travel arrangements such as flights, car rentals and hotels from a single point, in addition to offering reviews. Now we know which websites were used by travelers, next was the question of which websites were the most trustworthy? Surprisingly even though most of the respondents used Expedia more than TripAdvisor, both websites were equally trusted, at 34 percent. When viewing online customer reviews of hotels, what website do you consider most trustworthy? TripAdvisor was one of the first travel websites to embrace and promote user-generated content back in 2000, it is evident from their growth that majority of the travelers may prefer unfiltered reviews. In case of Expedia, it might not receive the same level of engagement but it does verify reviews with hotels by checking sales record ensuring that reviews are real. However, at the end the type of reviews come down to personal preference. When travelers are looking at these online reviews, what is the most important information that they’re looking for? 58 percent responded say that the price of the room is important to them. When reading reviews of hotels online, what’s the most important type of information you’re looking for? 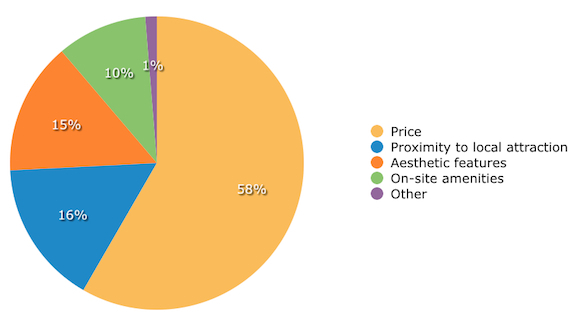 Other important information travelers look for in reviews includes proximity to local attractions (16 percent) and aesthetic features, such as the size of the room or the view (15 percent). Description of on-site amenities, such as a gym or restaurant received 10 percent of the vote. There is, however, a significant difference when looking at how each gender answered the question. Out of 15 percent travelers for whom aesthetic features was important, 63 percent were female and rest 37 percent male. Conversely, of those who said on-site amenities were most important, 59 percent were male, versus 41 percent female. We know price is an important factor to consumer looking at online hotel reviews, but we wanted to know other factors convinces them to book a room. We asked travelers what element would most entice them to book, and 40 percent say specific, guest-submitted comments in the reviews are most effective at driving their decision to purchase. 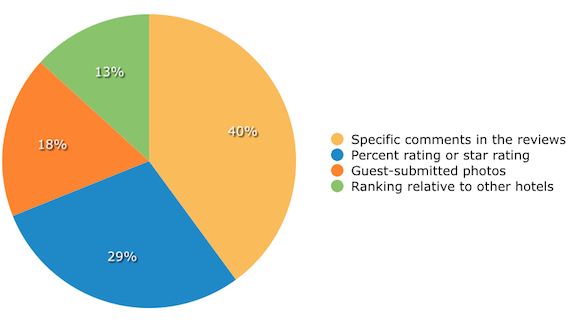 Which element of an online hotel review would be most likely to entice you to book a room? The next most enticing feature was the hotel’s percent or star rating according to 29 percent of the respondents and 18 percent sighting guest-submitted photos of the rooms. The least enticing element of a review, according to the results is the hotel’s ranking relative to other hotels in the area for 13 percent of the travelers. While the last question revealed that price is a huge factor, this data shows that, with the amount of information available online, travelers are looking at the bigger picture to make decisions. As much as travelers claim they value online reviews, our findings show they might not necessarily want to pay more for a room just because of positive reviews. 47 percent replied that they wouldn’t anymore for a hotel with positive reviews over one without positive reviews. How much more might you be willing to pay for a hotel with positive online guest reviews over one without? 30 percent of respondents say they would pay a “a little more” and other 17 percent said they would “moderately more” for rooms with positive reviews. Very few of the travelers said they would pay “much more” or “twice as much or more”. As we can tell from the survey that online comments can entice consumers to book a room, it seems like they do not feel like paying much more for one with positive reviews. Many consumers tend to for the overall value which could be a result consumer behavior changing from the recent economic slump. The survey results clearly show that 18 – 34 year-olds tend to use online reviews to find potential places to stay. TripAdvisor or Expedia generally used by this age group for looking at the price and user reviews. But they won’t spend much more for a hotel with positive reviews over one with without. A majority of hospitality professionals today realize the impact of authentic guest reviews, and their primary target is the younger age groups, who are willing to spend more of their disposable income on travel. As the survey concludes that knowing the most important aspects of your hotel’s online reviews and how consumers use them can really help your hotel’s marketing campaigns more efficiently. The marketing team can perform reputation management more effectively and entice the travelers to book with your hotel.